Raised Herringbone Band is one of those stitches you look at in a stitch dictionary but don’t get around to trying, then when you do, you wonder why it took so long to explore! Raised Herringbone Band built up in layers. It looks complex but in fact is relatively simple. First a layer of Satin stitch then a line of herringbone that is laced. You can change threads and you can also vary the width of the band. Also you can work the band on a gentle curve. It is a very effective border and quite complete in itself. It is interesting to work this stitch in different threads. I did a sample with a foundation of gold thread which looked great but it impossible to photograph! First lay down a band of Satin stitch. 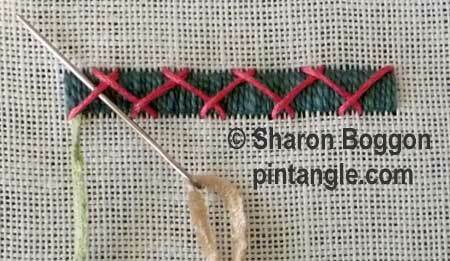 Satin stitch is in my stitch dictionary if you need to know how to work it follow the link to a tutorial. Next work a line of Herringbone stitch. 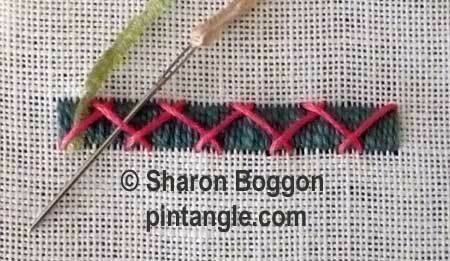 When working make sure the herringbone stitches are a little loose as lacing will tighten the stitches. Lace the herringbone foundation stitches as shown in the illustration. Bring the needle out at the base of the row. 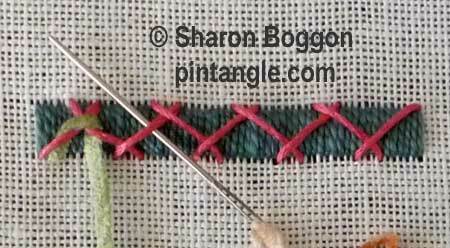 Thread the needle under the herringbone in an upward direction then move across the crossed bars of the herringbone turn the needle and thread in an downward direction. Repeat this motion under, up and over and under again type motion along the line of Satin Stitch. My tip is dont pull too tight just relax and lace the threads. I hope you enjoy Raised Herringbone Band. As I say experiment with different threads particularly at the lacing phase as this stitch lends itself to lots of interesting textures and variety. I tried a spiders web for this stitch. Metallic thread is always tricky to work with but seemed appropriate in this case! Here’s my cloth to date for 2013. I hope they catch the thief. An awful feeling of personal invasion when your bag is snatched. I hope no one was endangered. I’m very sorry about the theft of your bag! I sure hope they found the thief and your property. I know how you feel as my purse/handbag was stolen when we lived in London and it had ALL my ID in it, on a holiday week, when the Embassy was closed and their computer system wasn’t working. That stolen passport still haunts me 30 years later when I have to go through customs/immigration here in the US. Sorry for your loss of valuble things. you are really great to think about this challenge at this moment. you are a fine person. Good evening, everyone! I am sorry to hear about the theft. I hope you were able to cancel everything before someone used the credit cards. The following is my stitch 51 sample. Take care, okay? my post for stitch 51. I am so sorry to ear about yourbag. I hope it’s end well. Rotten luck about the bag Sharon. My sample is on my blog. So sorry about the theft. Sometimes it ends well – I am hoping for you. I like the new stitch 51. Despite being bummed out over the theft, I was able to have fun making a motif from the Raised Herringbone Band. Let’s call it a chameleon. Also posted is a section of the sampler that includes the 3 previous stitches. Sorry to hear about the theft. What a to-do. So sorry to hear your bag was stolen. I remember the awful sinking feeling I had when my wallet was stolen. Such a hassle to stop all the credit cards and get them re-issued. I lost a lot of identification items, too. I hope at least some of the items are found and returned to you. What a terrible thing to happen to you. It must be very stressful for you at this time, so thank you so much for still thinking of us. Sorry to hear about the theft of your hand bag. Something other than a sample! I just felt like a change . Here’s the start of adding my stitches. how awful for you Sharon. Hope you get everything replaced as soon as possible. Yet you still think of us. So sorry to read about your robbery. It can be such a bind when this kind of things happens. I hope that you get it sorted out quickly. Take care and my thoughts are with you. How terrible, I’m so sorry for you. Like Carolyn I hope you get your things back. really sorry to read that your bag was stolen. I hope you get it back soon. sorry to hear about your bag Sharon, credit cards can be replaced but I am sure you had personal things in there too which mean so much to you.I suppose there is not much chance of it being found but maybe you will be lucky, the valuables would have gone but other things could come back to you. What a co-incedence dear. Me too last my camara, so not able to post my week stitch 49 and 50. I finished it. Soon i will get a new camara and upload it. I am happy following your TAST. What rotten luck, Sharon. I do hope you get your things back! Oh, I’m so sorry about your bag. I hope you are able to keep the hassle to a minimum and suffer no serious consequences from the loss. I am so sorry to hear about the theft. I’ll keep my fingers crossed that you get everything back. Trust you to have a back-up stitch for us.